For those of us who love the exuberance of Robin Williams’ stand-up comedy and enjoy his movies and the way they make us laugh (The Birdcage), or consider the absurdity of war (Good Morning, Vietnam) and the impact of technology (Bicentennial Man), or move us to tears (Dead Poets Society), Robin Williams: A Singular Portrait, 1986–2002 will be a revealing and immersive experience into Williams’ persona. Written by photojournalist and friend Arthur Grace, the book is based on the very personal as well as professional perspective of knowing Williams for nearly 30 years. Grace’s experience with Robin Williams began in 1986 when he was sent by Newsweek magazine to photograph him for their “Comic Genius” cover story, which meant going on the road with Williams and his agent for several weeks. Grace is not a reporter in the traditional sense; he is a photojournalist, and the book is written from a perspective of spending a great deal of time with Robin Williams, both professionally in documenting his life for long periods at a time, and personally as a friend whose families vacationed and shared dinners and birthdays together. Grace’s meeting with Williams grew into a real friendship, and as a result his photographs of him have an emotional depth not easy to attain on a merely professional level. Arthur Grace is an excellent photographer and the book includes his photographs taken on various movie sets as the stills photographer (Mrs. Doubtfire, Good Will Hunting, Toys, Father's Day, Jakob the Liar), promotional studio shots, as well as photos from Williams’ live performances, as well as during personal times. Grace’s stories reveal Williams’ affable nature and generosity while giving us a peek behind the curtain in the making of Williams’ films like Good Will Hunting and Mrs. Doubtfire. He also sheds some light on Robin Williams’ frustrations with Hollywood, as when he was given the impression of being in the running for the role of The Joker in Tim Burton’s Batman, when in actuality Jack Nicholson had already been given priority. The book also relates Williams’ feelings in being nominated for (and winning) the Oscar for his performance in Good Will Hunting. But more surprising is Grace’s writing, which has a warm embracing tone that is unpretentious and reflects the life attitude of the author. The manner in which he relates his anecdotes of Williams, their relationship, and who he was, gives insight into Williams’ persona and creates a portrait that is more than the sum of its parts. Grace is a photojournalist, and the book does not delve into Williams’ occasional depression or the reasons why his friend tragically took his life in 2014 at the age of 63. 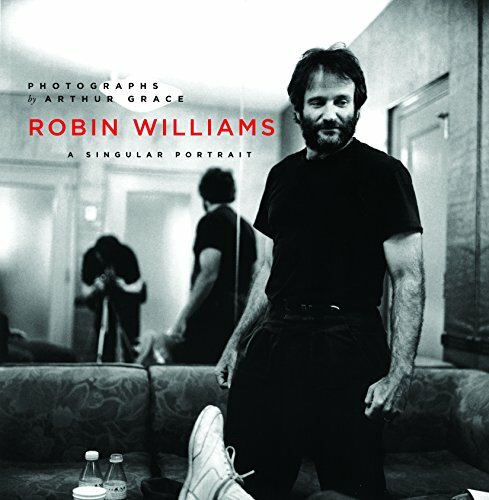 However, Robin Williams: A Singular Portrait, 1986–2002 is a wonderful book both in its photography, which is beautifully printed, and more importantly its content, which gives a meaningful and lasting portrayal of Robin Williams.